The Patriots got another loss in South Florida the old fashioned way…they earned it. Very uncharacteristic mental mistakes abounded and cost the team just about any slim chance they had at securing the #1 seed in the AFC playoff picture. Lost in the wild, wacky, horribly-played lateral play was a plethora of unforced errors and bad situational football which placed them in the position in the first place. From Stephen Gostkowski doinking an extra point off the goal post and then shanking a gimme 42-yard field goal, to Bill Belichick showing an almost Andy Reid-like clock management skills at the end of the first half, to Tom Brady inexplicably forgetting how many timeouts they had. It only gets better. Julian Edelman running before he secures the ball on a screen, Stephon Gilmore dropping a gift pick-six by Ryan Tannehill, false starts, an offense that looked unstoppable in the first half, and then scores just six points in the fourth quarter, they set themselves up for just a finish. The decision not to go for a touchdown on 4th down at the Miami one-yard line can be debated, but a field goal didn’t put the game away and even if a touchdown attempt failed, it would have left Miami with under 30 seconds and 99 yards to go. But the pièce de résistance was the decision to put Rob Gronkowski back as the deep safety with Miami on their 31-yard line with 0:07 seconds to go. Did the coaching staff really think that Ryan Tannehill was going to (could) throw the ball 75 yards down the field on a final Hail Mary? And even if they did, the team just signed 6’4 safety Obi Melifonwu who had a 40” vertical leap and runs like a deer. Inexplicable…but it is over and you have to own it. With the loss, the Patriots have about zero chance of now getting the top seed in the AFC. Baltimore took Kansas City to overtime but ultimately lost. They are now two games back in the standings with just three games to play. The #2 seed and a bye still remain a very doable proposition, however. The Texans lost to the Colts and the Steelers, like the Patriots, played down to the level of their competition and lost to the 2-10 Raiders. On a day when the defense sacks the QB five times and you block two punts…you have to get pretty creative to lose but that’s exactly what they did. The running game was non-existent today as the Patriots managed just 77 yards on 30 carries, a paltry 2.6-yard average. Facing a Miami defense that was being gouged for 144.7 yards a game and nearly double the average yards per carrying, that was a huge win for the Fins defense. In contrast, the Miami running game, nearly an afterthought for much of the year absolutely gashed the Patriots defense to the tune of 189 yards on 21 carries for a whopping 9.0 yards per play. Old friend Brandon Bolden looked like he was shot out of a cannon and galloped 54-yards untouched for the first of two touchdowns in the first half and Frank Gore was outstanding, rushing 12 times for 92 yards. Tom Brady was outstanding in the first half, he was virtually unstoppable until the final two minutes, but was held to just a pair of field goals down the stretch and it would come back to haunt them. Brady finished with 27 completions in 43 attempts for 358 yards with 3 TDs and 0 Interceptions. Both offenses were scoring at will in the first half, up and down the field each team was moving the ball and scoring with ease. The silly questions about Brady’s arm strength were put to rest (for now) on Sunday. On back-to-back plays, he lasered a 3rd and 10 pass to Edelman for 16 yards and then to Cordarrelle Patterson for a 37-yard touchdown. Rob Gronkowski had arguably his best game of the season and caught 8 passes for 107 yards and a touchdown on eight targets. He also took some hard shots to his knees and lower body. Kenny Stills was nearly uncoverable for Miami, turning in a great game catching 8 passes for 135 yards and a score on nine targets. He was consistently getting the better of Jason McCourty and easily won that matchup today. Josh Gordon turned in another solid game catching 5 passes for 96 yards, several of the difficult variety. Gordon and Patterson give the Patriots the size and speed that they’ve lacked in the passing game. Julian Edelman, doing the dirty work underneath, caught 9 passes for 86 yards, but his drop of a screen pass where it appeared he had some room to run was a drive killer. We’ll have to rewatch the tape of that one. Clock Management Andy Reid Style 1.0: The Dolphins had the ball at their own 25-yard line with 3:49 left in the half. The Patriots forced a three-and-out but didn’t use their timeouts as the clock ticked down to the two-minute warning. But after taking over at their own 20, they did nothing punted back to Miami with one minute left. Clock Management Andy Reid Style 2.0: After the Patriots sack Tannehill and have the Dolphins facing a 2nd-and-21, then they finally stop the clock with just 46 seconds left. They then sacked Brock Osweiler, then block the punt and take over at the Dolphins 15-yard line with 30 seconds left. Brady zipped another laser to Gronk put them at the Miami 2 with 21 seconds left. Brady then overthrew an open Chris Hogan along the back of the end zone, (a play we’ve been clamoring for) and then inexplicably took a sack on third down with no timeouts left and come away with nothing. Weird play in the third quarter when Trey Flowers punched the ball away from Gore causing a fumble. The officials signaled that Miami had recovered yet when the scrum had cleared the Patriots flipped the ball back to the official. Another one where maybe the tape will clear it up. The final play will mask what was a pretty good day by the Patriots secondary. Other than Stills, the rest of Miami’s passing game was pretty much held in tow. But that isn’t how the game unfolded. Then with 0:07 seconds to go, the Dolphins had the ball on their 31-yard line. The Patriots defenders said after the game, that they knew it was too far for a Hail Mary and it would be a lateral situation. Then why place Gronk back there for McCourty? Or Melifonwu for that matter. Tannehill hit Stills with about a 20-yard pass where Jonathan Jones took an angle that we haven’t seen since Jordan Richards whiffed on JuJu Smith Schuster in Pittsburgh a year ago. Stills lateraled to DeVante Parker who then lateralled to Kenyan Drake and the play unfolded and it looked like Moses parting the Red Sea as Patriots defenders were lost in the wake. Gronkowski stumbled and missed a chance to knock him out at the two-yard line and Miami had the finish that kept alive their playoff hopes for another week. Now the Pats are on to Pittsburgh, who have dropped three in a row. And lost again in stunning fashion to the lowly Raiders. But don’t expect that kind of performance from them next week. The Patriots coaches will have to work hard with the team after that meltdown.That is the kind of loss that can stick with a team. 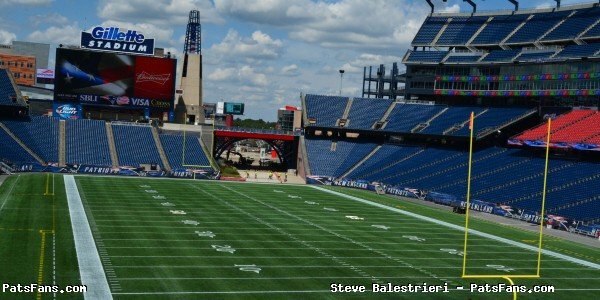 This entry was posted in 2018 Patriots Training Camp, NFL Commentary, NFL News, Patriots Commentary, Patriots Film Room, Patriots News and tagged Bill Belichick, Devin McCourty, Frank Gore, Kenny Stills, Kenyan Drake, Miami Dolphins, New England Patriots, Rob Gronkowski, Ryan Tannehill, Stephen Gostkowski, Tom Brady on December 10, 2018 by Steve Balestrieri. Good morning, here is your Sunday Patriots news 12-09, & AFC East Notes. Stephon Gilmore missed practice on Friday due to an ankle injury which just popped up on the injury report and is questionable. Obviously, if he can’t go it will be a big loss for the Patriots defense today. Did you Know? With four receptions today, James White will set a new Patriots team record for catches by a running back in a season. Tony Collins caught 77 passes in the 1986 season. White currently has 74 catches on the season. Did you Know Pt.2? With a win today, The Patriots will improve to 108-29 (.788) since 2001 on or after Thanksgiving (regular and postseason). That is the best record in the NFL during that time by more than 20 wins. Did you Know Pt. 3: With a win today, the Patriots would clinch the AFC East for the 10th year in a row, breaking a tie with the Cowboys and Colts for the most consecutive years making the playoffs. It will also be the 16th divisional title since 2001. Sony Michel has three 100-yard games, including Week 4 against Miami. Feed JE11 the Ball? Since 2014 (including the playoffs), the Patriots are 18-0 when Julian Edelman scores at least one touchdown. Every year, the national media all take turns proclaiming that “this is the year” the Patriots fall, Tom Brady falls off a cliff statistically, etc. The old rule about no cheering from the press box obviously doesn’t apply to journalists rooting against someone. And that someone is TB12. Never has a player that has accomplished so much for the league been the target of some much jealousy off the field. Everyone can’t wait to be the first to mark the demise of the greatest QB to ever lace them up in the NFL. Every pass is dissected looking for flaws, a diminishing arm strength, anything to point toward the door. While he was still playing, Peyton Manning was the poster boy for the NFL and made out of absolute Teflon. Nothing stuck to Manning, even when he threw three picks to Ty Law in the playoffs, the excuse machine was working in full-blown overtime. The league’s competition committee changed the rules to benefit his wide receivers. But eventually, Brady’s accomplishments left Manning in the dust and even the most jaded Brady haters couldn’t use that argument anymore. Step to the podium Aaron Rodgers. He’s the next “Chosen One”, the darling of the media and a guy who can never ever do no wrong. Every pass he throws is oohed and aahed over during the highlight shows. And how many times ad nauseam have we heard the past few years, “nobody but Aaron Rodgers can make that throw.” And every week we are subjected to the same Brady-Rodgers drivel that we were during Manning’s career. Except that Rodgers has accomplished even less. His team has missed the playoffs for the past two years, already eliminated in 2018. Can you imagine the hue and cry against Brady if the Patriots were eliminated just once under his watch the past few years? 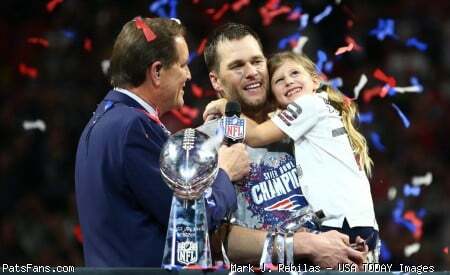 So much was made of the Brady-Belichick “feud” with the Alex Guerrero issue and impending divorce the past year or so and the Pats went 13-3 and came to within a strip sack of winning their sixth Super Bowl of the Brady-Belichick era. This year, the Patriots are 9-3 and are still in play for the top seed in the conference. But the real divorce was going on in the Frozen Tundra where the play of Rodgers, in part because of his feuding with Mike McCarthy has really dropped off. But not a word of that has been spoken. It has all been “McCarthy must go” and now he’s been fired. Rodgers has been remarkably immune to all of this. One can’t help but think that if that happened in Foxboro, and Brady’s record the past two years was 7-9 and 4-7-1, the headlines would be much different. Just like Manning. The Patriots are 1-4 in their last four trips to Miami and Tom Brady hit the nail right on the head when he said at his Friday press conference, “The reality is that none of that stuff matters — it’s really this team against that team,” he said. Miami is 5-1 at home and 1-5 on the road, so they are a very different team when playing in the confines of their own stadium as opposed to traveling on the road. The Patriots played very poorly there last season, when Jay Cutler, in the midst of a nightmarish season, looked like an All-Pro…for one night. This season, unlike others, like 2013, and 2015, it is the Dolphins who are beat up and have a lot of players injured or on IR. There is no mystique, no parquet floor magic about playing in South Florida. The Patriots just need to show up and be ready to play. Attempts – 33, Completions – 25, Yards – 276, Completion Pct. 75.8, TDs – 3, INT – 0 Passer Rating – 130.4, the result was a Patriots 35-14 blowout victory. Expect Bill Belichick to have the players ready to go today. The Patriots back in training camp hinted that new Defensive Coordinator Brian Flores would be more aggressive, ditching the old “read and react” defense of Matt Patricia that most fans hated, although it is hard to argue with the success that they’ve had with it. However, early in the year, much of what we saw looked similar to the past. But as players have been getting more comfortable in their roles and inside the system, we’re seeing more and more of what was perceived to be a more aggressive unit in 2018. They showed brief glimpses of it during games against Kansas City and Green Bay but two weeks ago against the Jets and then last week against the Vikings, Flores ‘let slip the dogs of war’ and the defense was dictating how things were going to be. That was the most aggressive that the Patriots have been in a very long time. With a veteran and very solid secondary, Flores can afford to be more aggressive but the confidence the coaches have shown, especially with rookie corner J.C. Jackson is very telling. They aren’t afraid to put their corners out there against some of the more explosive offenses in the league. However, being aggressive can result in getting burned and giving up long plays and/or touchdowns. But against Cousins and the Vikings, especially on 3rd down, the Patriots were dictating and they were extremely impressive. Will they do the same this week against Tannehill or was that to give the Steelers something else to consider for next week? The Buffalo Bills cut their ties to WRs Kelvin Benjamin and Andre Holmes on Tuesday. Buffalo acquired Benjamin, 27, in a trade from the Carolina Panthers in October 2017 for 3rd and 7th round picks in the 2018 draft. In 18 regular-season games for Buffalo, Benjamin caught 39 passes for 571 yards and two touchdowns. In his career, Benjamin has played in 58 games with 52 starts, amassing 207 catches for nearly 3,000 yards and 20 touchdowns. He ran afoul of the coaches and QBs in both Carolina and Buffalo but perhaps someone like Andy Reid can reach him where others have failed. He has stated he wasn’t a fit for Cam Newton in Carolina and reportedly told Bills quarterback Josh Allen he wouldn’t work on routes with him before a game earlier this season. “Sometimes change of scenery can be good for a guy and he’s got an opportunity to come in here,” Reid said. Maybe the Chiefs hope that they can catch lightning in a bottle and he can repeat the performance he had against the Patriots in Week 4 of the 2017 season where he caught four passes for 104 yards, in case the two teams meet in the postseason. The Miami Dolphins are still in the mix in the playoff race but if they’re going to get there, they are going to need production from QB Ryan Tannehill. A lot of production. He’s been with the team for seven years and he has yet to show the consistency that is needed to be the type of QB that the Dolphins envisioned when they drafted him. Despite the over-the-top headline this week that loudly proclaimed “Tannehill Owns the Patriots At Home”, he has a lot of work to do the next month. But it all starts today. And if Tannehill wants to be a Dolphin in 2019, he better turn some heads in the next few games…in a good way. With a career 40-43 record, and middle of the road stats across the board, he may have his coach’s confidence, but eventually, even Adam Gase will be forced to make a decision. Tannehill isn’t just playing for a playoff spot but a roster spot in 2019. The New York Jets continuing dysfunction once again raised its ugly head when the league announced linebacker Darron Lee has been suspended four games for violating the league’s substance-abuse policy. The suspension is effective immediately, meaning his season is over unless he decides to appeal it. The suspension will cost him $325,000 in game checks. Lee is eligible to return to the roster on Dec. 31, the day after their final game. Lee, leads the team with three interceptions, including one for a touchdown. But he’s had maturity issues. He was benched for a game in 2017 for showing up late to practice. He had a dustup with his girlfriend at a music festival that was caught on cellphone video. His teammate Leonard Williams perhaps saved him from further league issues, by pulling him away. This entry was posted in 2018 Patriots Training Camp, NFL Commentary, NFL News, Patriots Commentary, Patriots News and tagged Bill Belichick, Miami Dolphins, New England Patriots, New York Jets, Ryan Tannehill, Stephon Gilmore, Tom Brady on December 9, 2018 by Steve Balestrieri. Good morning, Here is your Sunday Patriots news 9-02, & AFC East Notes. It never fails that whenever the cut down to the 53-man roster occurs, some players who played significant snaps the year before finds themselves on the outside looking in. Eric Lee and Jordan Richards both played quite a bit in the Super Bowl and were cut on Saturday. That’s a good sign for the defense improving this year. 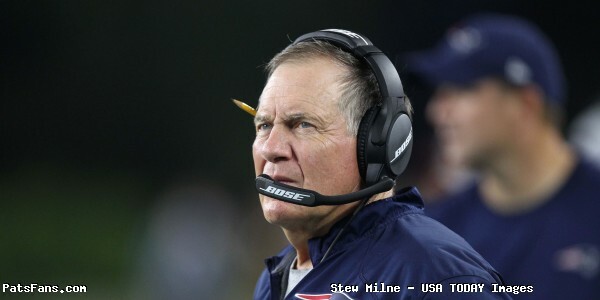 Of course, we are always reminded of the team’s and Bill Belichick misses in the earlier rounds of the draft. In essence, the Patriots are no worse nor better than everyone else with the ratio of hits to misses on the roster. Of course, when speaking of Belichick, his misses don’t seem as glaring when one takes into consideration WHERE the team drafts every year. The Patriots only kept 52 players on their initial roster cutdown on Saturday. We say initial because there will probably be plenty of changes in the next few days and also set the 10-man practice squad, with their initial group set to become official later today. Why 52? Without knowing what is in the works, it would appear that a trade…or two is on the horizon and they are keeping a spot open once a deal is finished or a physical taken. We shall see. Right now, the team is very light at WR and along the OL. It should also be noted that Ryan Izzo, the rookie tight end is supposed to go on IR tomorrow which will open up another slot. The Patriots obviously like what they have in Izzo who will be available to come off of IR during the season, but it appears they are looking at him with 2019 in mind. A minor surprise with Geneo Grissom making the roster. Grissom has always been a standout special teams player but has turned up his play defensively a notch. He had a pair of sacks in the Divisional Playoff win over Tennessee last year and has been fairly productive this summer. And for the 15th year in a row, the Patriots will have an undrafted player make the initial 53-man roster as corner J.C. Jackson has made the team. Another surprise was 3rd-year cornerback/kick returner Cyrus Jones was cut. After a tough rookie season, the light seemed to have come on a bit last summer when he tore his ACL. After fighting to get back on the field, he once again seemed to get it figured out but it wasn’t enough. Here is what the initial roster looks like, remember there are only 52 players. The Pepper Johnson interview with Deadspin provided some fascinating insight into the former Giant great and longtime Patriots assistant coach. Johnson spent 30 years as a player and coach in the NFL and served nearly all of it with Bill Belichick as a player and then later as a defensive line coach. He knows him as well as anyone. Which is why the interview was a fascinating look at not just Johnson but of Belichick. Johnson sunk that myth right off when he spoke about the exact thing on other teams, he experienced that in both Buffalo and with the Jets but not in New England. Johnson related in the interview that Belichick relies heavily on his staff. “I’ve had a lot of experience with winning. One of the things that I enjoyed so much when I first started coaching in New England was we had the roundtable, so to speak. It was more of a rectangle but we had the knights at the table,” he said. This leadership principle is no news to anyone who ever served in the military, especially in the realm of Special Operations and can be directly traced to his roots at the Naval Academy. In Special Forces, everyone had a say in the plan, but once the commander made his choice, everyone had to be onboard with it 100 percent. As we’ve seen in the Johnson interview, not all other coaches welcome that kind of input from their assistants. In Buffalo, Johnson’s input was not welcomed. So when it came to Bill Belichick, the one thing that stood out to Johnson, was that Belichick allowed him to solve his own problems, he just gave him a mission and let him accomplish it as he saw fit. The Patriots trade of the much-maligned safety Jordan Richards bore unexpected fruit as the Atlanta Falcons traded a conditional 7th round draft pick for the special teamer who is expected to be the Falcons new personal protector for the punting unit. Richards was a very good player on the Patriots special teams units, but really struggled whenever he was asked to play defense. His penchant for taking bad angles and missing tackles was the antithesis of his play on special teams. Part of the bile Pats fans had for him centered around that, last season, his play in the Pittsburgh game and in the Super Bowl, had the fan base howling. Another part of the bad feelings against Richards was the round in which he was drafted. The Patriots liked him and took him in the second round. If he’d been a 5th or 6th round draft pick, there probably wouldn’t have been as much of the vitriol leveled at him. Richards by all accounts is a great locker room guy and a nice guy at that. We’ve had the opportunity to see that first hand and maybe like another 2nd round safety that bombed in New England (Tavon Wilson), a change of scenery is all that is needed. The Buffalo Bills invested heavily in the QB position in the draft this spring, picking up rookie Josh Allen. They gave him the start in their third preseason game, normally considered a “dress rehearsal” for the regular season opener. If the game against the Bengals was any indication, they should sit Allen for the foreseeable future until he’s quite ready to take on the starting QB duties. Allen was sacked five times, and although he took the high road, and blamed himself for holding the ball too long, the Bills offensive line is a mess. The fact that all of the sacks of him occurred in the first half was telling of the state of that unit. Mercifully, Allen was removed because of the concussion protocol before he was seriously injured. There is going to be a lot of pressure on the Bills to push Allen into the starting role, especially if they get off to a slow start. But after investing a lot of capital into finding what they hope is a franchise QB for the next decade, playing him behind the OL as it currently exists, risks shaking the young man’s confidence. They should start Nathan Peterman or McCarron. The Miami Dolphins stumbled badly to a 6-10 season in 2017 after making the playoffs the year before. Now in Adam Gase’s third season, the Dolphins are coming in with a lot of new faces, veterans who they feel will set a different tone after cutting loose several veteran familiar faces this spring. It will need to start on offense where Miami averaged just 17.6 points per game a year ago, which isn’t going to cut it in today’s NFL. QB Ryan Tannehill is back and healthy and he has several new weapons to use. Wide receivers Danny Amendola and Albert Wilson, as well as the ageless RB Frank Gore, will be looked to, to keep the chains moving and make big-time plays at crunch time in games. Another area is the turnover margin where Miami was -14 or 29th in the league. Tannehill will have to really cut down on the picks thrown by Jay Cutler a year ago. But with the opener against an opponent who made the playoffs last season in the Titans, it will be a good test. A September 30th trip to Foxboro, where Julian Edelman will still be on suspension will also be a big measuring stick for the Fins. The New York Jets made big waves this week when they traded QB Teddy Bridgewater and a 6th round draft pick to the New Orleans Saints for a 3rd round draft in the 2019 NFL Draft. The Jets signed him this spring for $6 million, of which, they are on the hook for just his $1 million dollar bonus, the remaining $5 million will be paid by the Saints. While the deal definitely worked out in the Jets favor, we appear to be in the minority here. I wouldn’t have moved Bridgewater this season at all. Darnold is a rookie and with a very questionable OL, he may struggle early in the process. The question of whether or not to start him right away, given that OL is now moot. But while the Jets did indeed get the Saints’ 3rd rounder, if they had just let Bridgewater walk at the end of the year in free agency, they’d have gotten a 3rd rounder in compensation. But with a QB class that isn’t considered strong, his price may have been higher and he gives the Jets a much better chance to win now if he’s pressed into service. For at least this season, he’ll back up Drew Brees in New Orleans, and then will be a free agent unless the Saints work out a new deal with him during the season. I wouldn’t have traded him this year, but we’ll see how it shakes out. Listen to our Patriots 4th and 2 podcasts on blog talk radio as the writers Russ Goldman, Derek Havens and myself from PatsFans.com discuss the latest Patriots news. This entry was posted in 2018 Patriots Offseason, 2018 Patriots Training Camp, NFL Commentary, NFL News, Patriots Commentary, Patriots News and tagged 2018 Patriots preseason, 53 Man Roster Projection, Bill Belichick, Buffalo Bills, Chris Hogan, Dont'a Hightower, James White, Julian Edelman, Miami Dolphins, New England Patriots, New York Jets, NFL, Patriots, Patriots edge rushers, Rob Gronkowski, Tom Brady, Trey Flowers on September 2, 2018 by Steve Balestrieri. The preseason is over, and the Patriots ended it in the Meadowlands as their backups downed the Giants’ backups 17-12 to finish off the preseason 3-1, not that it matters. The starters for both teams took a seat and let the backups get their playing time in, as many were putting together an audition tape for the 31 other teams in the league. Rookie quarterback Danny Etling went wire to wire under center tonight, we’ll have more on him below, as both Tom Brady and Brian Hoyer got the night off. The team may have suffered one significant injury as OL Ulrick John who is considered one of the players definitely in the mix for a backup lineman’s spot on the 53-man roster, left with a foot injury and didn’t return. He was seen after the game in a walking boot. Marquis Flowers and J.C. Jackson also left via injury during the game, but neither was considered serious. Flowers was evaluated for a concussion but did return to the game, while Jackson was treated for dehydration. Bill Belichick was upbeat and smiling after the game in his post-game press conference and stated that the team only played about three dozen players tonight, similar to last season’s finale as well. “Really proud of our team tonight. The guys played hard,” Belichick said. “Those guys really did a good job. It was a good warm night. I thought they showed up well. We’ll see on film but I think I learned a lot about these guys. I like the way they competed. We’ll see. So, now the coaches will go about the business of paring down the roster to the initial 53-man limit by Saturday at 4:00 p.m. and then announce a practice squad on Sunday by 1:00 p.m. We say initially because you can expect the bottom of the roster to be a fluid place for the first week or so of the regular season, right up to when the team plays the Houston Texans to begin the regular season. So here is our quick observations from tonight’s game and how certain players may fare in the roster cutdown. J.C. Jackson: The undrafted rookie from Maryland had a big night, intercepting two passes and defending three others. He showed very good ball skills on both picks, high pointing the ball and snagging both. But he had his not-so-great moments as well. He totally whiffed on Amba Etta-Tawo’s 41-yard touchdown play and looked awful there. He was also beaten several times in the game as well. But his compete level is very high and he had the production you’re looking for in a game like this. Belichick said he had a long way to go, but they like his skills. He may have earned a roster spot, but at least a practice squad slot. Cyrus Jones: Jones had a disappointing night, he didn’t flash much in the return game, not being able to make the first man miss and break tackles which is his specialty. He played significant snaps both on the edge and at slot corner and didn’t stand out. He could lose his spot if the team feels McCarron or Berrios can handle punt return duties. Etling completed 18-32 passes for 157 yards with a touchdown and two interceptions. He rushed for 113 yards on seven carries. He still struggles with accuracy and consistency, which isn’t a shock considering his limited snaps this summer. His footwork suffered while he was under pressure, but these are correctable. He showed enough to warrant a practice squad slot and the team can see how much he can develop this season. He is more athletic than perhaps he was given credit for, throws a good tight spiral and has very good arm strength. Mike Gillislee/Riley McCarron: Two players seemingly on the bubble before the game, didn’t play and are probably safe…for now on the roster. With the shortage of wide receivers on the roster, McCarron probably gets a spot initially on the 53-man roster. While fans on social media are clamoring for Braxton Berrios, he missed nearly as many practices as he attended this summer. And he didn’t stand out anymore so than McCarron either offensively or as a returner. But we’ll see. Ralph Webb: The rookie from Vandy had another solid performance in the finale. He rushed 12 times for 41 yards and found the end zone again when Etling’s pass at the goal line was behind him and he made a nice catch, reaching behind himself and hauling it in. He definitely rates a practice squad look and we wrote here, that he may rate a higher ceiling than Gillislee at this point, but the coaches may opt to go with a veteran back early this season. Derek Rivers/ Vincent Valentine: The pair of players who both missed all of 2017 played a significant amount of snaps, well into the second half but seemingly for different reasons. Valentine seems firmly on the bubble. The rotation of big men inside has him on the outside looking in right now, unless a trade of someone else is made this week. We wrote about that as well earlier on Monday. Rivers doesn’t seem to be in danger of losing a roster spot, but after missing all of his rookie season due to injury, the team clearly wants him to get in as much action as possible. He should be a member of the edge rotation this fall. Keionta Davis: The big, 6’4, 280-pound 1st-year player had a disappointing finale on Thursday night. It started off well when he showed good power and split a double team coming off the left edge and pressured Giants QB Kyle Lauletta and forced an incompletion. However, he lost containment on an end around, crashing down inside and allowing the runner to get to the edge with speed and the result was a 19-yard gain. Going against the twos and threes, we expected Davis to flash more than he did. But he should still be in consideration for a practice squad spot. Jason McCourty: The 10-year veteran started at safety and played the entire first half. When an injury occurred in the third quarter, he returned to the field before being replaced by Jordan Richards. That can’t be a good sign for him moving forward. On the broadcast, it was said that the coaches may just want him to get as much work as possible at safety before the regular season begins. That is possible, but we’re putting him squarely on the bubble here. Big time props have to go to WR K.J. Maye, and RBs Kenneth Farrow and Khalfani Muhammad. The three were signed to the team just this week and had very limited time to prepare and practice before playing the Giants. They all knew they had a snowball’s chance in hell of making the roster but all were intent on maximizing an opportunity to audition for a slot in the league. All acquitted themselves well. This entry was posted in 2018 Patriots Offseason, 2018 Patriots Training Camp, NFL Commentary, NFL News, Patriots Commentary, Patriots News and tagged 2018 Patriots preseason, 53 Man Roster Projection, Bill Belichick, Cyrus Jones, Danny Etling, J.C. Jackson, Jason McCourty, Keionta Davis, New England Patriots, NFL, Patriots, Patriots edge rushers, Ralph Webb, Tom Brady on August 31, 2018 by Steve Balestrieri. After all of the draft preparation, OTAs, mini-camps, training camps and three preseason games, it all comes down to the final preseason game for the fringe players on the rosters for both the New England Patriots and the New York Giants. Most of the players who will see action tonight won’t make either team. And many will be playing in the final game of their NFL careers. For many others, they’ll be trying to create as much good tape as they can as a demo for the 31 other teams in the league to garner a practice squad invitation and a chance to further their NFL dreams. The starters, especially the quarterbacks, Tom Brady and Eli Manning will not see the field and watch from the sidelines until the games are for real beginning next week. In last year’s finale, also against the Giants, the Patriots used 38 players. Other than the long snapper Joe Cardona, punter Ryan Allen, and kicker Stephen Gostkowski, who had no competition in camp, only seven of those players made the 53-man roster. Only one of the fifteen players on defense in last season’s finale against the Giants made the roster, DE Geneo Grissom. However, for those few players that are trending up as the preseason winds down, this final audition can make a big difference. Bill Belichick spoke about that earlier this week. The game will be broadcast locally on WBZ-TV in Boston with Bob Socci, doing the play-by-play, Scott Zolak handling the color commentary and Rob Ninkovich and Steve Burton handling the sideline reporter duties. 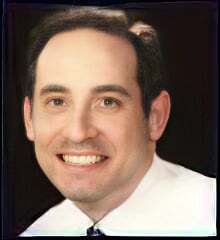 Andy Hart and Paul Perillo from PFW will be live in the studio offering instant analysis as well. So from a New England perspective, here’s what to watch for when the Giants and Patriots meet again to end the preseason. RB Ralph Webb – Webb was a dark horse candidate to make the squad given the depth that the team had at the position when training camp began. But Webb worked hard and in his limited snaps in practice played well. He had a very impressive debut against the Redskins in the first preseason game. Since then, he’s been nearly invisible. It could mean that the team will likely try to hide him on the practice squad. The Patriots added RBs Kenneth Farrow and Khalfani Muhammad this week. Look for them to get a lot of work in the game as an audition for other teams. Webb? Not so much tonight. RB Mike Gillislee – The veteran back who was a starter at the beginning of 2017 is likely gone. Jeremy Hill has (in our opinion) clearly outplayed him and is a bigger factor in the passing game, something the Patriots value highly in their backs. He still has a shot at making the roster if the injuries to Sony Michel and Rex Burkhead are deemed long-term, although both returned, albeit limited, to practice this week. He’s auditioning for another team. QB Danny Etling – The Patriots late-round draft choice is another player who hasn’t seen much of the field since the opener. Has he shown enough development in practice to warrant a practice squad spot? The feeling here is yes. He may go wire to wire tonight at QB, with a chance to show what he can do. WR Devin Lucien – Lucien has made the rounds in the last year. He was with the Patriots in camp and then bounced around with several team’s practice squad a year ago before making his way back to New England this summer. He’ll probably be the most targeted receiver in tonight’s game, but his chances of cracking the 53-man roster are pretty low. DB Jason McCourty – The move to safety was an intriguing one, was it a good or bad sign? Opinions seem to be mixed on that subject. I think if we see a lot of him on the field it will not be a good sign for the veteran to make the team. DE Trent Harris – “Toolbox Trent” from Miami has had a difficult time getting thru the deep group of edge players to get significant snaps this summer. But when he’s been on the field, he’s been productive. He’s someone who may get snapped up by another team after the cutdowns are made. LB Christian Sam – The “other” linebacker taken in the draft is athletic but hasn’t had nearly the impact that fellow rookie Ja’Whaun Bentley has had this summer. He’ll be looking for a performance that will convince the coaches that he’s worth developing long-term and may end up on the practice squad. DE Keionta Davis – The first-year player has turned some heads with his play this summer. He’s far from a finished product but certainly has shown potential. The feeling here is he’s close to making the 53-man roster, so he may be one of those players who the coaches want a final look at. Crowded secondary – The Patriots have a few difficult decisions to make in the secondary. Both Jonathan and Cyrus Jones have returned to full duty and Jonathan, I believe is a lock to make the roster. Cyrus however, is a different story. With the uncertainty in the return game, his special teams’ versatility may be the difference in him getting a roster spot. The team also has rookies J.C. Jackson, Keion Crossen and practice squad player Ryan Lewis in the mix. All of these players have a legitimate shot at making the roster and tonight’s game may be the difference in who stays and who goes. Corey Bojorquez – The UDFA rookie punter hasn’t seen the field in one preseason game yet. Bill Belichick and ST’s coach Joe Judge kind of danced around the subject of “Bojo” but the feeling is that they don’t want any tape on him to risk losing him to another team. This entry was posted in 2018 Patriots Draft, 2018 Patriots Offseason, 2018 Patriots Training Camp, NFL Commentary, NFL News, Patriots Commentary, Patriots News and tagged 2018 Patriots offseason, 2018 Patriots preseason, 2018 Patriots season, 53 Man Roster Projection, Bill Belichick, Chris Hogan, Christian Sam, Danny Etling, Keionta Davis, New England Patriots, NFL, Patriots, Patriots edge rushers, Ralph Webb, Rob Gronkowski, Tom Brady on August 30, 2018 by Steve Balestrieri. With the first three preseason games in the books, it is time to take another look at pinning the Patriots 53-man roster. We’ve gotten to see everyone on the playing field with the exception of punter Corey Bojorquez in game action. The team has one more game left at the Giants before the cut down takes place and the coaches have a lot of decisions to make on the bottom third of the roster. With some injuries, the team has already made some changes and rest assured, the 53-man roster on cut down day will no doubt look much different around mid-November. No changes here, the team goes with two QBs and Danny Etling goes to the practice squad where he can learn and try to usurp Hoyer or someone else for the backup job in 2019. No changes here either, however with both Michel and Burkhead hurt, if either is deemed long-term and placed on IR, it will open the door for another back to make the roster. Most believe that to be Mike Gillislee, I believe it would be Ralph Webb who didn’t play last night and they’ll be looking to stash on the practice squad. Hill looks good this summer, he got dinged up against the Panthers but after the game said he was good to go. This group of running backs should be heavily involved in the passing game this year with Burkhead, White and Michel all bringing very good ability there. The backs and the tight ends will make up for the lack of depth at WR. Hollister is banged up now and missed the Carolina game. He’s projected to be a much bigger part of the offense this season. Allen was reportedly much more in tune with the passing game this year, but we’ve seen no evidence of that in the preseason. The blocking tight end Ryan Izzo is hurt but a candidate for the practice squad. I still find it amazing that Allen is going to still be paid $5 million this year, or half a million per each reception from last year. Gronkowski is fine and was kept in bubble wrap all summer, but he’ll be a big part of the offense once the games are for real. With he and Hollister and the good options of the running backs in the passing game, we should see plenty of two back, two tight end sets this season, especially in the first month of the season. There are really only four wide receivers on the roster for the first week of the season due to Edelman’s suspension and Slater being an STs ace only. That lack of depth is of a concern due to the threat of injury and Eric Decker’s inability to morph into the offense, where he’s struggled to pick things up and then abruptly retired on Sunday afternoon. Riley McCarron is on mighty thin ice here, he may only survive a few weeks until Edelman returns from suspension. Braxton Berrios is a practice squad candidate. McCarron I believe was going to get the nod over Decker anyway since he actually got in some work with top offensive unit against the Panthers. WIth the three releases, earlier this summer of Malcolm Mitchell, Jordan Matthews and Kenny Britt, this unit’s depth took a big hit and they may opt to scan the waiver wire or make a trade here and now. Malcom Brown is trade bait IMO. And they may opt to move him and others in a package. Mike Reiss mentioned Detroit and Golden Tate… Makes more sense than Dez Whatshisname. The state of the offensive line took a hit when their top draft choice, tackle Isaiah Wynn tore his Achilles against the Eagles. Marcus Cannon has been out for a while now too. But once LaAdrian Waddle picked up that 15-yard penalty against Carolina, the coaches inserted Tobin at right tackle. He gets the nod over Cole Croston and Ulrick John right now although it is far from a certainty. Karras is tough and can play center or guard. Keionta Davis is the tough cut here, the team obviously likes what they see in him, he got extended plays with the starters in Carolina. He’ll be a practice squad candidate. Another tough cut is Vincent Valentine who came back from an injury last year and has looked okay out there at times this summer. The addition of Danny Shelton should really help solidify the run defense in the middle. He and Lawrence Guy look from here to be the starting duo. Malcom Brown on the final year of his rookie contract is relegated to the top backup and possible trade bait, which if they make a move before September 1, could be good news for Valentine. Christian Sam is a practice squad candidate, Grigsby and King make it on Special Teams ability. Bentley has had a terrific summer and is primed to earn significant snaps on defense this year. Harvey Langi’s injury cuts short his comeback bid. They may opt to place him on IR or try to sneak him on the practice squad. Having Hightower back and healthy is a big boost for the defense as a whole. It also allows Van Noy to move back to play to his own strengths. Flowers is a speedy linebacker who can help against mobile QBs and is another strong STs player. Gilmore, Rowe, and Dawson are locked. The two Joneses are now healthy and Jonathan will take over the duties in the slot with Dawson backing him up. Tough cuts loom with rookies Keion Crossen, Ryan Lewis, and Jason McCourty. Cyrus Jones edges out them because of his kick return ability on special teams. I could easily see them opting for one of these final cuts here and this last preseason game may make a difference. McCourty could still make the squad, but was the move in Carolina, putting him in at safety a positive or a negative? His status has been a tough one to read all spring and summer. The top three are locks and playing very well. Ebner is healthy now and is a special teams’ ace. The much-maligned Richards will make the squad (sigh) due to special teams ability over Eddie Pleasant who was vying for his spot and was released Sunday night, much to the chagrin of thousands of Patriots fans. It turns out the roster battle between Allen and rookie Corey Bojorquez wasn’t a battle after all. Bojorquez is the only player on the 90 man roster that didn’t play this preseason, other than injuries. Some are theorizing that Bojorquez wasn’t played for a reason so that the Patriots can stash him on the practice squad because they’ll be no game tape of him. Gostkowski and Cardona had no competition at their respective positions this summer and probably slept better than anyone. This entry was posted in 2018 Patriots Offseason, 2018 Patriots Training Camp, NFL Commentary, NFL News, Patriots Commentary, Patriots News, Patriots Rumors and tagged 2018 NFL Season, 2018 Patriots preseason, 2018 Patriots season, 53 Man Roster Projection, Bill Belichick, Chris Hogan, Dont'a Hightower, James White, Julian Edelman, New England Patriots, NFL, Patriots, Patriots edge rushers, Rob Gronkowski, Tom Brady, Trey Flowers on August 27, 2018 by Steve Balestrieri. Good morning, Here is your Sunday Patriots news 8-26, & AFC East Notes. Things that Make you go hmm: Alex Guerrero, after all of the hoopla surrounding him, Tom Brady, Bill Belichick all offseason, was on the team plane heading to Carolina. Guerrero won’t be on the sidelines during the game but will travel with and treat the players (Brady, Gronkowski, Edelman) that utilize his skills prior to the games. Bill Belichick didn’t let the preseason game go without a teaching point. With the team being outplayed by a wide margin and down by multiple scores, several of the young players went overboard celebrating a stopped two-point conversion. Belichick lit into them and no doubt pointed out what the score was, it is no time to celebrate, one will remember the Derrick Mason bit with the Ravens several years ago. The offensive and defensive lines were pretty much dominated by the units of the Panthers of Friday night. After last week’s performance against Philadelphia, that has to be a major disappointment for the coaching staff. Eric Decker didn’t do much to justify a roster spot with another poor performance on Friday night in Charlotte. Targeted five times, he caught just two passes for 12 yards and didn’t play a snap with Tom Brady and the starting unit. His best hope to stick is that Julian Edelman’s suspension gives him a reprieve for a couple of weeks to get it sorted out. Even with depleted depth at WR, his chances of sticking at this point have to be getting slimmer each day. Mike Gillislee likewise isn’t looking like he’s going to stick to the 53-man roster. Jeremy Hill looks quicker and more decisive in getting to the hole and his inability to be a factor in the passing game hurts his chances. Hill seems (at least from here) to have clearly won the battle for the bigger back duties. Like Decker, his chances of sticking now appear to center around uncertainty. With both Rex Burkhead and Sony Michel hurt, he may make the roster out of default. Burkhead looks to be much closer to return at this point and if Michel gets put on IR, then he too may work his way on the roster. Red Zone Defense was one of the few bright spots on what was a pretty dismal first half for the Patriots overall. The Panthers marched down the field three times and while the defense didn’t play well, they did stiffen up in the red area and hold Carolina to just three field goals. Stephon Gilmore had a nice pass breakup in the end zone after the initial ten-minute opening drive, forcing the Panthers to settle for three. Keionta Davis played over Derek Rivers in the first half and saw a considerable amount of snaps with the first unit. It is a positive sign for the 1st year player that the coaches want to see what he can do against the top opposition. The staff obviously likes what they see in him. Jordan Richards appears locked again on the 53-man roster, the much-maligned safety played on all four special teams units with the starters in the first half. His main competition, Eddie Pleasant, played zero snaps with the starters. Only one player hasn’t appeared in any of the three preseason games, rookie punter Corey Bojorquez has yet to make an appearance this summer. The strong-legged punter from New Mexico now has zero chance of unseating veteran Ryan Allen. Jason McCourty will be a curious decision for the coaching staff at cut down time. The veteran corner was placed at safety and was very late getting over on Panthers’ touchdown pass in the second half. But then made a great play on the next red zone sequence, reading the play and shooting into the backfield to hit the runner for a loss. Playing a variety of positions may help his case with the coaching staff. We mentioned the struggles continuing with Eric Decker, with just two weeks remaining before the season opener, things are still unsettled there. Julian Edelman, Chris Hogan, Phillip Dorsett and Cordarrelle Patterson are locks, that is only three for the first month of the season. It leaves plenty to be done in a short amount of time. Dorsett helped his own cause in a nice game Friday night, catching all four passes thrown his way for 36 yards. Included in that was a key fourth down pass to keep the chains moving, a sign of trust from Brady that was encouraging. Patterson played nearly the entire game which left many scratching their heads, but the belief here is that he is still working his way into the offense and the coaches just want to see the different ways they can possibly utilize his talents. It looks right now like Riley McCarron may earn at least an early roster spot. He was on the field early last night and has punt return ability. He still catches the ball with his body too much but he got the opportunity over Decker in four WR sets in the first half. But his two drops late, didn’t help his chances. Braxton Berrios is hurt and hasn’t played, a rookie isn’t going to make the team that way. Devin Lucien is a hard worker but appears as a very long shot to make the team at this point. Despite this, the passing game should be fine, especially after Edelman returns. With Rob Gronkowski and Jacob Hollister at tight end, James White, Burkhead and Michel out of the backfield, there are plenty of targets for Brady to throw to. But some added depth would be on the coaches to-do list when the cut downs begin elsewhere around the league. Rookie linebacker Ja’Whaun Bentley has been having a very solid summer. That continued on Friday night in Carolina. Although Elandon Roberts got the start, Bentley played a significant amount of snaps with the first unit in the first half and accounted for himself in another positive performance. In the second half, with the backups, Bentley was calling the signals and acting like the leader of the defense, something that shouldn’t be lost on the coaches. Bentley has continually been improving his game since Day 1 of camp and should be in line to see significant snaps once the regular season begins. Despite Roberts getting the start on Friday, we’d put Bentley on equal or better footing than the veteran and it shouldn’t be long before the big Purdue linebacker is getting the start on this defense. Less than a year from his ACL surgery, Patriots third-year cornerback Cyrus Jones returned to the playing field getting some work in with the secondary as well as in the return game. That in itself was a very positive sign for the Alabama alum and he looked fast with some sharp cuts in the return game. His first kickoff return was his best a 27-yarder where he showed good vision and cut-back ability before it was wiped out by a penalty. Jones has been the forgotten man after a nightmarish rookie season and his sophomore year wiped out by an ACL injury in the final preseason game. His speed and change of direction ability seem back to where they were and he fielded all of his attempts cleanly. His status for next week will bear watching. 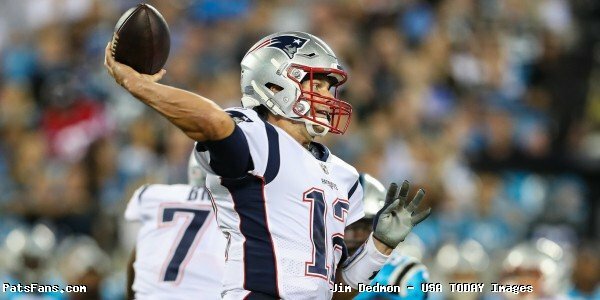 This entry was posted in 2018 Patriots Offseason, 2018 Patriots Training Camp, NFL Commentary, NFL News, Patriots Commentary, Patriots Injuries, Patriots News and tagged 2018 Patriots offseason, 53 Man Roster Projection, Bill Belichick, Chris Hogan, Dont'a Hightower, James White, Julian Edelman, New England Patriots, NFL, Patriots, Patriots edge rushers, Rob Gronkowski, Tom Brady on August 26, 2018 by Steve Balestrieri. One of the best parts about the preseason is that it’s really only the experience and not the final score that matters, which is good news for the Patriots after losing 25-14 down in Carolina Friday night. Here’s a quick rundown of what we came away with from this game. 1) Deatrich Wise brought down a notch – After what had been a pretty impressive preseason to this point, Wise had a rough outing against a very physical Panthers offensive line Friday night. Wise got pushed around quite a bit on Carolina’s opening drive, which saw the Panthers have a fair amount of success as Christian McCaffrey and Cam Newton combined for 53-yards on the ground during that series. A third down run late in that series by Newton saw Wise get pushed out of the play as Newton took off for an 11-yard run on a 3rd-and-9. but Panthers quarterback got upended by Jonathan Jones. Newton flipped in the air and landed on his head, which saw him leave the game and head to the medical tent to be evaluated. He eventually returned. Fortunately New England’s defense eventually held Carolina to a field goal, but it was surprising to see Wise struggle after what had been an impressive preseason. He finished the night having played 25 snaps with two tackles, but the good news for Wise is since this one doesn’t count, it will hopefully be just a bad memory that he can simply chalk up to being nothing more than a learning experience. 2) An up and down night for Gilmore – Stephon Gilmore had a tough night Thursday night, with the veteran making some plays but also struggling at times during this one. Gilmore came up with a big third down stop to force the incompletion from Newton to rookie receiver D.J. Moore, which was key as it killed the drive and forced Carolina to settle for a field goal. Unfortunately, the next series didn’t work out quite as well after Gilmore gave up back-to-back gains of 28-yards on the Panthers’ second offensive series. 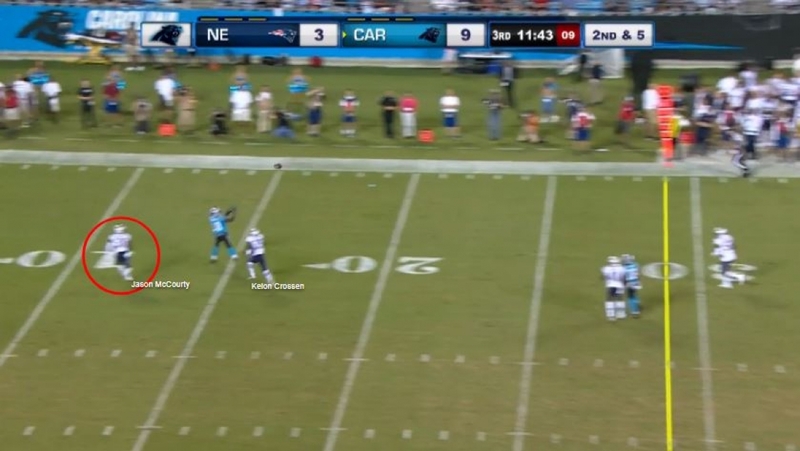 The first was just a great back shoulder throw by Newton to Devin Funchess that arrived before Gilmore turned around. However, the second was just a bad play that saw Gilmore get turned after Curtis Samuel cut inside and then broke out, with Gilmore having to chase him down. 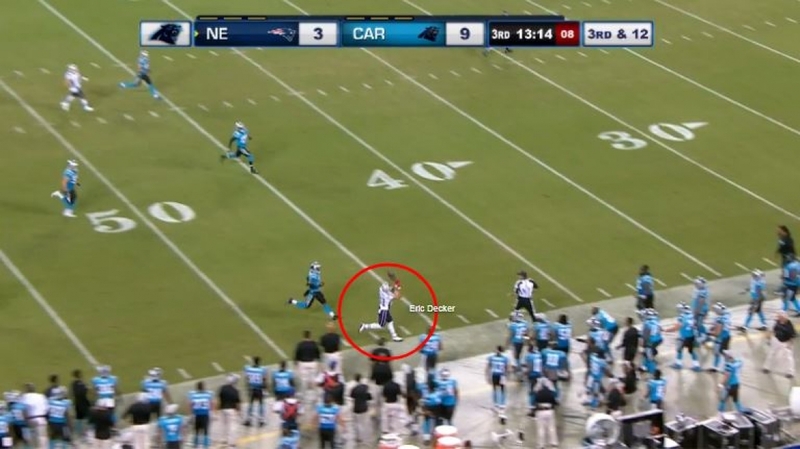 Looking back on that play, it didn’t help that the Patriots tried to get pressure after sending Patrick Chung on a blitz, but Chung was cut down in the backfield by running back Christian McCaffrey before he had a chance to disrupt the play. Many will likely remember that Gilmore didn’t play well against the Panthers last season and that contest ended up being the turning point in his season, which saw him play well down the stretch. Fortunately, with this game happening during the preseason, maybe he’ll get started a little sooner in 2018. 3) Tough Night for Brady and the offense – Brady and the offense had an off night against the Panthers, with the quarterback not enjoying the same success he had last week. They scored just 3 points during the first half of play with Brady at the helm, with Carolina’s defense making things difficiult. The opening series saw the offense go three-and-out, with Brady opting to try and hit Rob Gronkowski on a 2nd-and-4 play where both Gronkowski and Julian Edelman ran double outs but were both well covered. The pass was batted after left tackle Trent Brown fell down and defensive end, Mario Addison, got his hands on the football. It was a quick play, but Brady had James White uncovered to his right and just didn’t see him. Brady would find himself under pressure on the next throw on 3rd down and somehow managed to fire a fairly good throw to White, but the running back was immediately cut down by speedy defensive back Donte Jackson just short of the first down marker. The next drive saw the Patriots put together a 14-play, 67 yard drive that led to a 27-yard field goal by Stephen Gostkowski. 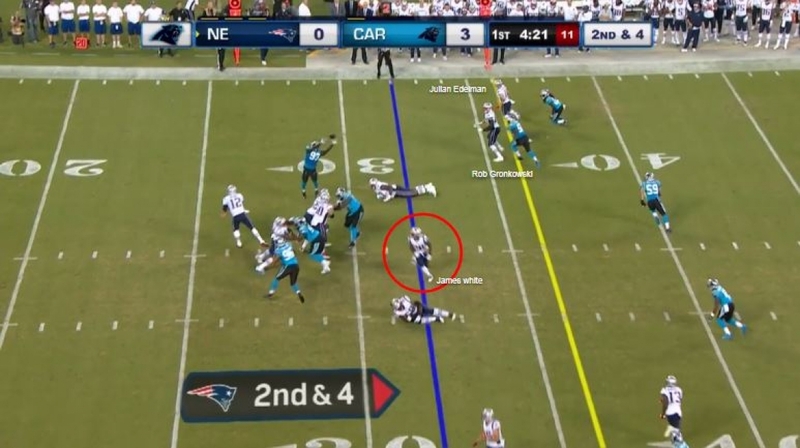 That drive was frustrating because the Patriots managed to get down to the Panthers’ 4-yard line but LaAdrian Waddle made a serious mental mistake when he allowed himself to get called for an unnecessary roughness penalty, moving the Patriots back 15-yards which essentially ruined what was a terrific scoring opportunity and forced New England to settle for a field goal. Brady also put together another drive on New England’s next possession where they took over with 7:05 left in the half and marched from their own 28 down to the Panthers’ 28 as they chewed up over 5-minutes of the clock. 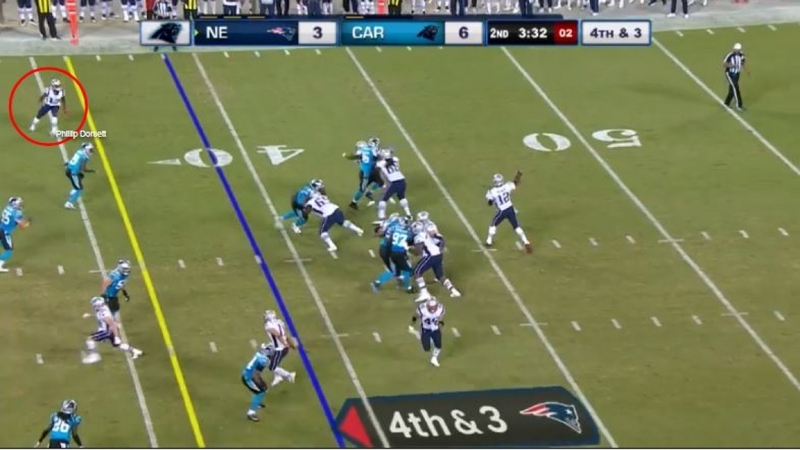 On that drive, Brady even managed to convert a 4th-and-3 at the Panthers’ 39 after Brady looked left but then turned back and fired a strike to Phillip Dorsett (see above). But the drive stalled again on a 3rd-and-5 where Brady targeted tight end Will Tye up the right sideline, with Tye leaping up and nearly making the completion. Unfortunately, that would be Brady’s final pass of the night as Gostkowski would push the kick wide right on the 46-yard attempt. Overall, Brady finished 12-of-18 for 102 yards on a night where it just came down to the fact he had limited options against a Panthers defense that simply played really played well while New England needed perfect play but saw mental mistakes cost them. 4) Edelman Looked Good – While Edelman won’t be out there for the first four weeks, he showed enough on Friday night to make fans believe he’ll be an impact player when he returns. The veteran wideout looked solid against Carolina, making quick cuts and finishing the night as the team’s leading receiver on third down after being targeted three times with two receptions, both of which moved the chains. Overall, he looked just as elusive and ran great routes, which is impressive for a player coming back from a serious ACL injury. It’s frustrating knowing they’ll have to make it through without him, but he appears to be fully recovered and hasn’t shown any drop off during what little time we’ve seen him. 5) Patriots Ground Game Struggled – The Patriots offensive line had a rough time against Carolina’s defense and as a result, the ground game suffered. Mike Gillislee got the lion’s share of the snaps Friday night, carrying 10 times for 35-yards including a touchdown. But at one point things were pretty grim as Gillislee and Jeremy Hill had combined for more rushes for no gains or a loss than they had positive carries. Carolina arguably has one of the better groups of linebackers in the league and they were just brutal Friday night, wreaking havoc and making things difficult on New England’s offensive line. As a result, there will likely be a lot to discuss when the team looks at the film after what was certainly a frustrating night. 6) Better Night for Hoyer – Hoyer’s final stat line may not show it, but he actually had a better night Friday night down in Carolina. He finished 16-of-24 for 109 yards, but was actually 12-of-15 before the offense’s final possession of the game where he finished 4-of-9 after he started heaving it up to try and make plays. Hoyer looked more under control and had more zip on his throws Friday night, leading the offense to 11 second half points to at least have them make it somewhat of a contest after the Panthers at one point mounted a 25-3 lead. He’s gradually improved over the last couple of weeks after a dismal first outing, with Belichick opting to keep Danny Etling on the sideline for this week as Hoyer played the entire second half and finished the game. While there’s still reason to be concerned should he be forced into the starting line-up during the regular season, it’s good to at least see him making progress. 7) Nice outing for Elandon Roberts – Roberts had a good game Friday night, with the linebacker showing tremendous lateral speed and some good instincts. He finished with three tackles, one of which came on a nice play where he made a terrific read and stopped C.J. Anderson short of the goal line on a 3rd-and-4 from the Panthers’ 4-yard line early in the 3rd quarter. Unfortunately, Eric Lee was beat on the next play after he let quarterback Taylor Heinicke get around him and then couldn’t track him down as Heinicke ran it in on a bootleg to extend the Panthers’ lead to 15-3. But still, it was a nice showing on a night where the defense faced a tough challenge and Roberts was one of the bright spots. 8) Time running out for McCourty – Any shot at seeing the McCourty brothers together on defense this season seems to be slipping away after Jason McCourty saw himself see time at safety after some less than stellar cornerback play this preseason. He didn’t take the field until the second-half Friday night, but saw time at safety and along with Keion Crossen, was beat on a 31-yard strike from Heinicke to Chris Samuel early in the third quarter. However, McCourty did make a nice play down on the goal line after he came up and made a tackle for a loss on a 2nd-and-3, meeting Cameron Artis-Payne near the sideline and dropping him behind the line of scrimmage. But the fact he’s seeing time at safety is clearly Bill Belichick’s attempt to see if he can provide some depth in the secondary. That doesn’t bode well for a player many thought could become a solid starter at corner for the team this season. 9) Decker Continues to Struggle – It was another rough night for Eric Decker, who was targeted five times with just two receptions. The veteran receiver has yet to see a target from Brady and he made a critical mistake on Friday night where he blew a first down opportunity for the offense after he negated what would have been a first down on a 3rd-and-7 after Hoyer hit Devin Lucien but Decker was called for a false start. But he then didn’t help his cause on the next play when Hoyer went deep to him on a 3rd-and-12 and he failed to watch where his feet were on the play. Granted, Hoyer should have thrown it more inside but Decker had a shot to keep the ball in bounds but seemingly lost track of where he was. Catching it and finding a way to keep his feet in bounds could have been a nice moment for him, but unfortunately, it didn’t happen. With the release of Kenny Britt, it seems like Decker’s chances to stick around appear to be there, but so far this preseason, it certainly hasn’t gone well. Between his drops and issues like what transpired again Friday night, there continues to be reasons to be concerned with his play. 10) Jones gets back into it – One bright spot for the Patriots was the play of Cyrus Jones, who saw some time returning kicks down in Carolina. Jones finished the night with three kickoff returns for 38-yards and also fielded two punts, making a fair catch on one while returning another for one-yard. But the big thing was the fact he looked much more confident and comfortable back there and showed some pretty good burst each time he caught the ball, which is encouraging. Either way, not a bad night for a player who had a rough start and it would certainly be advantageous for the Patriots if Jones can contribute both in the return game and on defense for them this season. 11) Hill Seemingly Escapes Injury – A scary moment happened late in the game after running back Jeremy Hill seemingly suffered an injury with just over 3-minutes left in the contest. Hill was yanked down with a horse collar tackle following a 6-yard run on a 2nd-and-2, where Sterling Bailey decided to pull him down despite the fact Hill was near the sideline. The running back limped off the field and looked to be in serious discomfort, which was frustrating given that he’s worked hard and seemed poised for a roster spot and it’s never a good thing seeing a player like that get hurt at that point in the game. Fortunately, he told reporters after the game that he’s “good” and didn’t appear to be limping in the locker room, which thankfully means he avoided serious injury. At the end of the day, while the game goes down as a loss, it will hopefully be a wake up call for a group that had been riding high after two nice wins to open the preseason. They’ll now return home to prepare to close out the preseason next week against the New York Giants at MetLife Stadium. This entry was posted in 2018 Patriots Training Camp, Patriots Commentary on August 25, 2018 by Ian Logue. Entering the 2018 season, New England Patriots safety Patrick Chung will be playing in his ninth season with the team during his 10 year NFL career. On Instagram this week, Chung shared a photograph of him and teammate Julian Edelman, both of whom where drafted in that same 2009 draft and he reflected back on their lengthy time together as teammates. “Ten years and counting bubs” Chung wrote. Back in March, Chung signed a two-year, $7.80 million contract extension that will keep him in Foxborough through 2020. This entry was posted in 2018 Patriots Training Camp and tagged Devin McCourty, Julian Edelman, Matthew Slater, Patrick Chung, Rob Gronkowski, Stephen Gostkowski, Tom Brady on August 23, 2018 by Robert Alvarez. The Patriots and Panthers meet in the preseason Week 3 matchup and a very important one in more than one aspect this week. This is the final tuneup for the starting units for both teams, what has normally been deemed a dress rehearsal for the regular season. The starters will mostly sit next week as the players on the bubble will get one more chance to show what they have before the final cut downs to the 53-man roster begin. Last season, Cam Newton and the Panthers shredded the Patriots in Foxboro and Newton afterward didn’t even consider New England a playoff team, calling their game against the Eagles, “the first playoff team we’ve faced.” If this were a regular season game, that would get a bit of play with Bill Belichick and the coaches but this won’t be the case. However, he’ll be sure to remind them of what the Panthers did to them that day. So, from a Patriots perspective, here are the things to watch for this week as the Pats try to prepare themselves for the regular season. Newton Presents First Test Against a Mobile QB: The Patriots are going to face a mobile quarterback for the first time this summer and will be facing one against DeShaun Watson and the Texans to start the season. With no joint practices, the Patriots defense has had to face only Tom Brady and Brian Hoyer, for the most part, this summer, other than their two preseason tilts, neither against a mobile QB. In the game last year, won by Carolina on an FG by Graham Gano as time ran out, Newton sliced and diced the Patriots defense, going 22-29 for 316 yards with three TDs and one Interception. He also ran eight times for 44 yards and a touchdown. The designed runs and QB draws the Panthers ran last year will be a big focus of the defense this week. The Pats were sliced and diced on those last year, as well as the defensive backfield breakdowns where Carolina hit big play after big play. Newton should play well into the second half of this one and this will be a big test for the young defenders and prepare them for Watson, although he may not taking off and running as much, at least early in the season after tearing his ACL last season. Carolina TEs, RBs Against the NE LBs in Space: This is a very big test for the linebackers this week who looked suspect against the Redskins but much better against the Eagles a week ago. 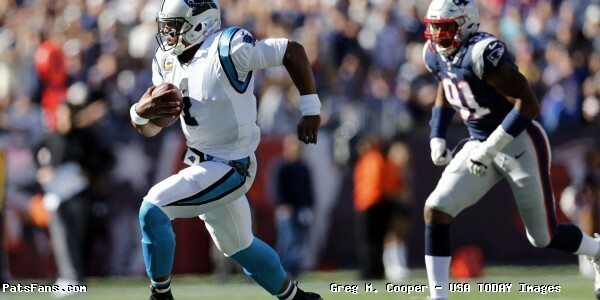 With Newton’s legs, he will stress the second level of the defense as he is a threat to take off and run at any time. But he also has great targets in the passing game at the tight end position with Greg Olsen and RB Christian McCaffrey. Both are a tough assignment in any scenario, McCaffrey caught 80 passes out of the backfield in 2017 and Olsen who missed nine games due to injury in 2017 is a huge target for Newton and will be looking to set the tone for the season with a strong game this week. The Panthers looked to upgrade their backfield this spring and brought in former Broncos RB C.J. Anderson who is a dual threat to run or catch a pass out of the backfield. He had 28 catches a year ago. This week’s test will be a big barometer for the Pats LBs, considered a weak spot a year ago. Dont’a Hightower should see the field extensively in the first half, but we also expect to see what rookie LB Ja’Whaun Bentley can do against this talented group. Kyle Van Noy and Marquis Flowers should also see plenty of snaps against Newton. Time For Decker, and Dorsett to Show Up: Time is running short for Eric Decker and Phillip Dorsett if they want to make the 53-man roster. Kenny Britt had a very impressive spring until, in the last minicamp drill, hurt his hamstring. It was deemed at the time minor. He’s been invisible ever since and hasn’t practiced all summer. He was released on Wednesday. Decker was signed after Jordan Matthews hurt his hamstring and was released. To say that he hasn’t stood out is an understatement. He’s yet to catch a pass in two preseason games and has shown a tendency for drops, both in practice and in the game. Both of these players could use at least a couple of receptions to show up on the scoresheet to give the coaches some confidence heading into September. Decker was signed to a very team-friendly contract and his only guaranteed cash was his $75,000 signing bonus. There is no dead money involved with him. He can be cut loose with no salary cap hit if the coaches decide to release him. The other missing WR has been Phillip Dorsett. He was regularly one of the best receivers on the field during the early days of training camp. He’s cooled way off since then and you never hear his name called. He’s been virtually invisible in the preseason as well. Carolina’s defense looks to be very solid in the front seven but there are questions for the unit in the secondary. They’ll be looking to solidify things back there while the Patriots and Brady are looking to find out who’s going to be ready to go Week 1. These two guys have to build some chemistry with QB Tom Brady heading into the regular season. Neither of them are filling anyone with confidence that they’re ready to do so, once the games are for real. Friday night is a big game for both and the clock is ticking. Patriots Running Game vs Panthers Defense: The New England running game has looked good thus far this preseason with Jeremy Hill and James White leading the way. Rookie Ralph Webb, and veterans Mike Gillislee and Brandon Bolden have also been productive in spurts thus far this summer. However, Sony Michel, the Pats first-round draft pick has been absent since August 1 when he left practice early after injuring his knee. Later, it was reported that he had fluid drained from it and he’d be out “about 10 days”. We really don’t expect to see Michel until the regular season. Rex Burkhead has been out with what has been termed a slight tear in his knee. He returned to practice Sunday and has been limited in practice since then. It seems doubtful that he’ll play on Friday. Missing two of their key pieces at the running back position really limits the offense, because we’ve yet to see what they can do with all of their weapons present. The Panthers run defense was stout last year allowing only about 80 yards per game which was 11th best in the NFL last year. I’d look for Hill and White to get the majority of the early work with Gillislee and Webb, both fighting for roster spots to go all out when they’re in the game. Carolina’s front seven, led by Luke Kuechly is very stout and will be a good barometer for the ground game this week. They were mostly solid last week but did give up a few big runs. Young Players Get a Big Game to Step Up: The bottom end of the 53-man roster is still wide open for the Patriots and there are still plenty of roster spots that are far from settled. For some of the younger players, playing the Panthers in a dress rehearsal is a huge opportunity to show what they can do. On offense, the aforementioned Webb at running back is a long-shot to make the roster. However, if Michel or Burkhead isn’t ready to start the season, that may open the door a crack for him to work his way into a roster spot Wide receivers Braxton Berrios and Riley McCarron are definitely on the bubble right now. Neither has shown much in the passing game while both have punt return capabilities, they haven’t stood out as a positive there either. Berrios has been banged up and is now back at practice and this will be a big game for both to showcase their talents. On defense, Bentley has already solidified a roster spot. Now he’s playing to earn reps with the starting unit. But some other young players have plenty to play for. Keionta Davis, the productive edge rusher from Chattanooga who missed all of his rookie season with a bulging disc in his neck, has shown up and fighting for a roster spot. He’s still on the outside looking in, but he and Vincent Valentine are looking to turn some heads. In the secondary, Stephon Gilmore, Eric Rowe and Duke Dawson, by virtue of his draft status are locked for the roster. Veterans Jonathan Jones, and Cyrus Jones have just returned to practice after off-season surgeries cut their 2017 short. They’re fighting it out with newcomer Jason McCourty and rookies J.C. Jackson, Keion Crossen as well as Ryan Lewis, Jomal Wiltz and Ryan Lewis. Those eight are probably fighting it out for three slots. It will be intriguing to watch. 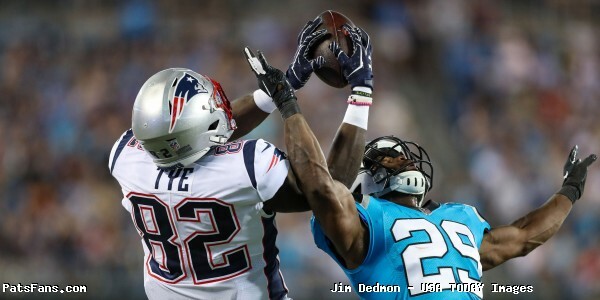 This entry was posted in 2018 Patriots Training Camp, NFL Commentary, NFL News, Patriots Commentary, Patriots News and tagged 2018 Patriots offseason, 53 Man Roster Projection, Bill Belichick, Cam Newton, Carolina Panthers, Christian McCaffrey, Dont'a Hightower, Greg Olsen, James White, Julian Edelman, Luke Keuchly, New England Patriots, NFL, Patriots, Tom Brady on August 23, 2018 by Steve Balestrieri.